Sussex completed their first win of the season in the Specsavers County Championship after beating Derbyshire by 10 wickets at Hove. Derbyshire did have the satisfaction of making Sussex bat again after they were dismissed for 307, but Sussex’s openers Chris Nash and Ed Joyce needed just three balls to knock off their victory target of 11 runs to secure their first Championship win at Hove for more than a year. Resuming on 195 for 6, Derbyshire lost Matt Critchley in the fifth over of the day after the start had been delayed until 1.10pm because of rain. Critchley (20) gloved a lifter from Steve Magoffin before Ollie Robinson struck in successive overs. Shiv Thakor, who had top scored in Derbyshire’s first innings 150 with 49, again impressed in making 81 from No.6 from 102 balls with ten fours and it needed a good delivery which held its line and found the edge to remove him. Robinson had Tom Taylor (9) caught by Ross Taylor, diving to his left at third slip in his next over to leave Derbyshire 256 for 9, still requiring 41 to make Sussex bat again. 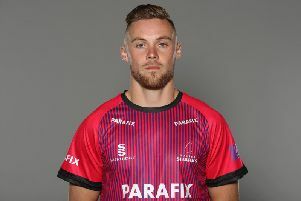 But the hosts were held up by some merry tail-end hitting by Tony Palladino (29 not out) and Ben Cotton, who smashed 53 from 29 balls together before Cotton was bowled by Ajmal Shahzad for 25. Sussex Head Coach Mark Davis said: “There’s a great sense of relief that we have got that first win. “We haven’t had the best of things with the weather this season and when I got up this morning and saw the rain I feared the worst but our groundstaff did a terrific job, both today and on the first day when they got the ground fit for us to have 40 overs and take nine wickets which really set us up for the victory. Derbyshire batsman Wayne Madsen admitted it had been a tough four days for his team. “Being bowled out for 150 in the first innings put us under massive pressure against a good Sussex team. “It’s a massive learning curve, particularly for our young bowlers, at the moment and we have to make sure when we get back to red-ball cricket we learn from our mistakes and put things right.